This is a beautiful, wood carving, hand-carved by me, Josh Carte. 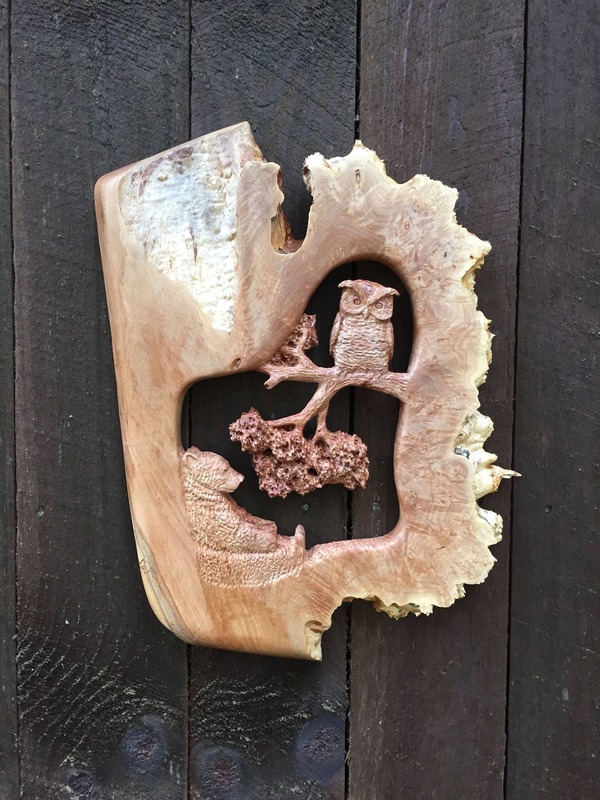 It is a perfect wood gift and a great piece of home and living decor. 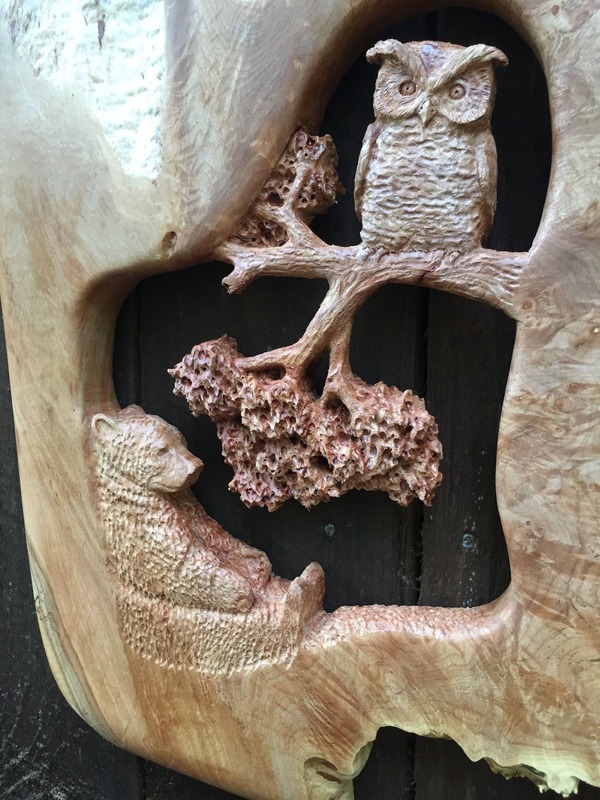 It depicts a bear and an owl in the forest. 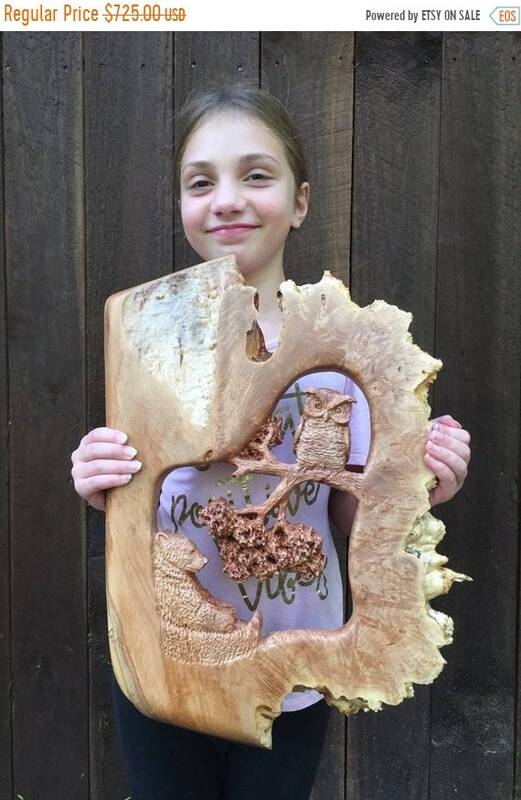 This is an original piece of wood art. FREE SHIPPING TO THE USA! Please see my "Policies" for international shipping. This is a very large, Big Leaf Maple Burl! It makes a perfect gift for a friend, loved one, or oneself. 21" tall, 15" wide, 1 1/2" thick. I signed and dated the back. There is also a hanger on the back for easy installation. I am in charge of everything that goes on in this shop....The carving, packaging, listing, shipping, communication...It's all me. I don't have any elves, helpers or workers. So, when you buy from me, you are supporting me and my family. We really appreciate you! 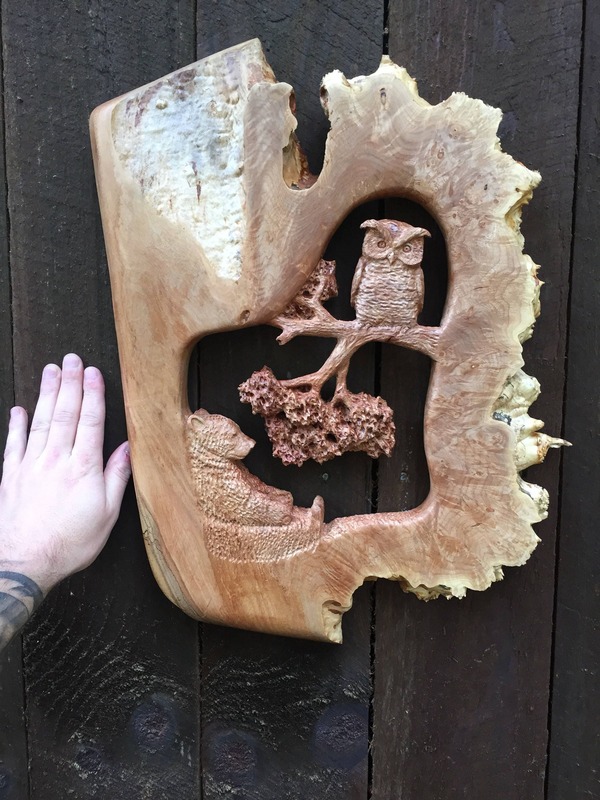 I used a whole lot of different tools to make this carving. It began with a sketch and ended with lots of sand paper and urethane. In between were jig saws, hand tools and router bits. This type of carving is called, "pierced relief". It is a very time consuming style of carving but I love every minute of it! This is truly a one of a kind carving. There are some live edges and bark inclusions to this carving. I really love this type of wood. These burls grow on Big Leaf Maples and are just amazing to me. Many buds are sent to one area of the tree where a burl is formed and the resulting wood is very hard with interlocking grain. I will be glad to engrave something in the back, as long as it is fairly short, free of charge. Something like, "Happy Anniversary! ", "I love you so much", "9/16/07", etc. Please let me know, as a note, what you would like carved in the back when you purchase this carving. My engraving is nothing fancy, but very meaningful. If there is anything that I can do for you at all...Questions, concerns...Just wanna talk about wood.. :) Send me a message here on Etsy, an email at carpcuts [!at] live.com or call 740-385-4487. Thanks!